How could Lizzy Enders's father abandon her at a girls school run by nuns? She's surrounded by Catholics--but she's Methodist! Shunned by the other boarders, Lizzy befriends a wandering carpenter named José, who with just three tools--and unflagging faith--builds an elaborate spiral staircase in the new chapel in mere weeks. When he disappears without a trace, Lizzy realizes that the way she sees things is not always the way they are. 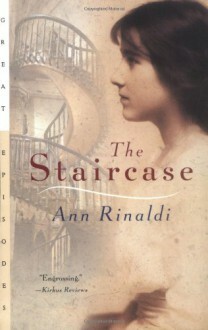 Inspired by the legend of the "miraculous" staircase in the Chapel of Loretto in Santa Fe, Ann Rinaldi skillfully blends the mystery surrounding the staircase's builder with the daily trials of a spunky thirteen-year-old girl growing up in the 1870s. I couldn't stand the characters the writing, or the plot. It bored me nearly to death. I really couldn't stand this book. The only good part was the opening paragraph. Addtionaly, the characters are all fake and lifeless pieces of cardboard.